We’ve got your whole Christmas covered here at the Hawarden Estate Farm Shop. Our Estate Butchers have put together an order form with the best cuts of local meat to see you through to the New Year, our Food Hall shelves are stocked full of locally sourced products with provenance ready to be made into hampers. You name it, we’ve got it. If we haven’t - we will do our best to get it for you. Download our Butchers Meat Order Form here or pick one up from John and the team over at the counter. If it’s pies and our deli’s famous sausage rolls you’re after, look no further. Either download our Deli Order Form here or pick one up from Kevin and the team over at the counter. Simply email your completed order forms to christmas@hawardenestate.co.uk or hand it to one of our team at the Farm Shop. Orders are to be placed by Friday 7th and collected here at the Farm Shop by Monday 24th December. Please check our Christmas Opening Hours here. From Saturday 24th November our Makers + Producers Marketplace to the front of the Farm Shop entrance will be taking place on both Saturdays and Sundays all the way up until Christmas. We have a fantastic line up of local makers filling our stalls each weekend so you’re guaranteed to find something new. Our Fruit + Veg Market will be open every day as usual during the run-up to Christmas stocked with local produce fresh every morning. Our gift vouchers are available in dominations of £10, £20 and £50 and are available to use across our sister businesses The Glynne Arms and Broughton Park General Stores. This year we have made it even easier, you can now purchase vouchers online and we will post them out to you. We sell kindling, seasoned and unseasoned logs harvested from the 6000 acres of woodland here at the Hawarden Estate. Simply give us a call, pop into the shop or download an order form to place your order. Please return your order form to christmas@hawardenestate.co.uk and a member of our team will be in touch. 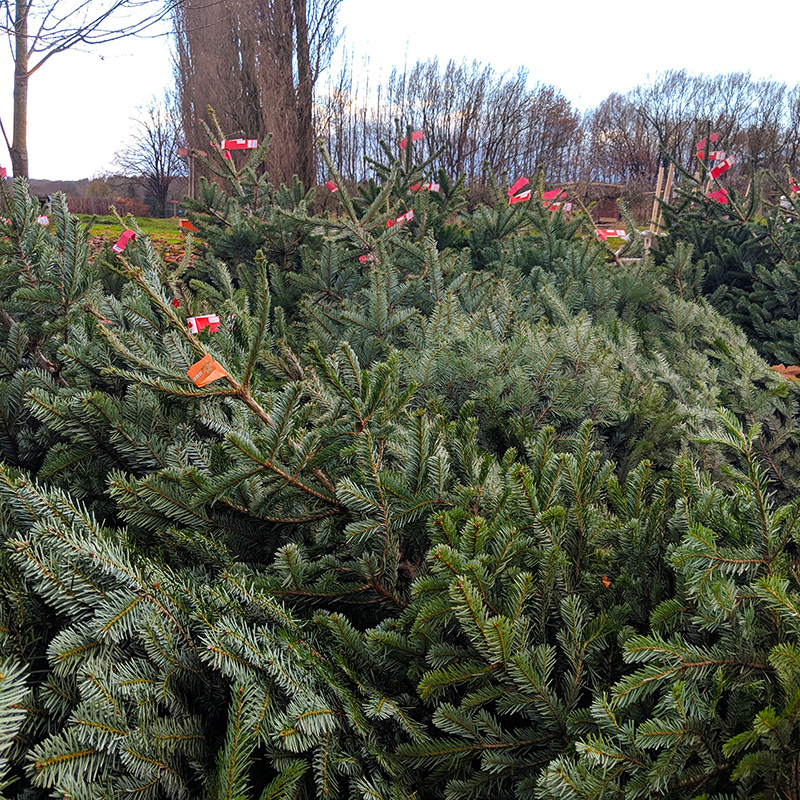 Our Christmas tree market will be up and running from December 1st. Come along, select your tree and we can deliver it to your door. Choose from a small, medium or large hamper and chose whatever you like from our shop to fill it. From cheese, to beer, stationary, books, cacti, candles - you can tailor your hamper to be the perfect gift and we will wrap it for you. Available at the Farm Shop from December 1st.